Origin Acoustics' crowd-pleasing, CEDIA-winning Valet Amp, powered by Amazon Echo Dot, can only be purchased by direct dealers through Origin ... or now any qualified dealer through Portal.io. We sit two integration companies in front of a camera and ask them to share their experiences with this newly free service. 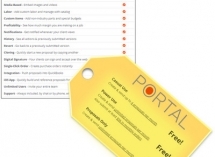 Manufacturers are flocking to an impressive new portal platform launched by Portal.